Our latest news delivered straight into your inbox. "Professor Jens Schou (1854-1935): Provenance re. Thorvald Bindesbøll Ceramic Jar"
Professor Jens Schou's private clinic at Martinsvej no.8 in Fredericksberg, Copenhagen. Jens Schou, a pre-eminent alumnus in the history of Danish medicine, was born in Vejle in the south-east of Jutland on 28 September 1854. He qualified in 1879 and became registrar at the Garrisons Hospital from 1880-1881. The following year he became Professor of Anatomy and two years later Consultant at Fredericksberg Hospital until 1887. From 1888, Jens Schou was a consultant at Camillus Nyrop's establishment, and from 1893–94 he worked at J.Chievitz’s hospital for infectious diseases, where he served as Professor of Anatomy. The year 1899 saw him as Senior Consultant at Joseph’s Hospital. Whilst at St. Joseph’s he acted as life surgeon to His Majesty King Christian IX from 1899-1906. He was co-editor at the Weekly Journal for Doctors and also a member of The Board of Directors for the Carnegie Foundations. In his surgical practice, he ran a private clinic in Gothersgade in the centre of Copenhagen, and between 1886-1911 he was a lecturer on current surgical issues on the General Medical Board, these lectures highlighted by his own vast experience; between 1893–1903 he was also co-editor of “Ugeskrift for Læger” ("Weekly Journal for Doctors"). Contemporary sources cite Professor Schou as “blessed with a cool, clear brain”, and his undoubted technical skills allowed him to gain great prominence very swiftly, as his reputation accelerated. 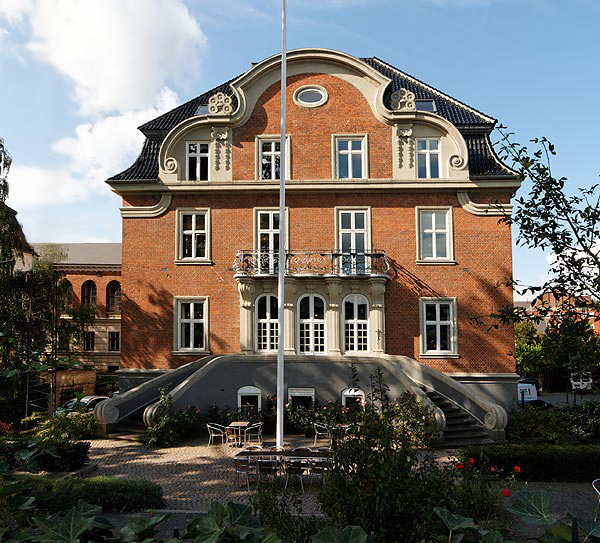 In 1910, to accommodate and minister to his ever growing private clientele, Jens Schou opened an exclusive and much sought-after private clinic at Martinsvej no.8 in a quiet and secluded cul-de-sac in fashionable Fredericksberg, in the heart of Copenhagen. Martinsvej No.8 was specially commisioned by Professor Schou from the renowned Danish architect Rolf Schroeder (1872-1948), and it became one of the architect’s best-known projects. Built in the high baroque German style of the late 19th and early 20th century, the building essentially comprised an imposing block which encompassed an inner courtyard. The building itself was richly adorned by sweeping, foliate motifs in the “Skønvirke” style, the Danish equivalent to the Art Nouveau period in France and Belgium, and Jugendstil in Germany and Austria. As well as being the life surgeon to King Christian IX , Professor Schou also became personal physician as well as a close friend to his daughter, Princess Dagmar (1847-1928), upon her return to Copenhagen from Russia. Princess Dagmar became Maria Feodorovna, Empress of All Russia when she married Tsar Alexander III (1881-1894). Her eldest son was the ill-fated Tsar Nicholas II, the last Tsar to rule Russia. Maria Feodorovna, whilst Empress, gifted Professor Schou, as a token of her respect and affection, an exquisite imperial presentation silver-gilt cloissone kovsh (a traditional Russian drinking vessel), resplendent with amethysts, the kovsh in the shape of an exotic stylised bird with Maria Feodorovna’s personal inscription to Professor Schou and a hearfelt message on the underside of the vessel; this was beautifully presented in a velvet lined wooden casket, adorned with the Russian imperial crest. The kovsh was specially commissioned by the Empress from the celebrated Pavel Ovchinnikov (1830-1888), who was officially appointed Court Jeweller to Tsar Alexander III in 1865, and to King Christian IX in 1888. This exceptional object was auctioned at Christie’s, King Street in London in 1971, where it fetched 3,000 guineas; it had been consigned for sale by Dorrit Klenow Joslin, the great niece of Professor Schou. Today, the kovsh is in the collection of the Walters Art Museum in Baltimore, Maryland. When His Majesty, King Edward VII visited Denmark in 1904, according to the “London Gazette” of April that year, he bestowed upon the Professor the title of Commander of the Royal Victorian Order (C.V.O.). In 1918, at the height of his fame and with a truly international reputation, the Professor decided to retire and he sold his private clinic at Martinsvej. The year previously – 1917 – he had acquired a magnificent country estate and farm at Astrup on the Isle of Zeeland, this comprising, in addition to extensive arable landholding, a thousand acres of woodland and the enchanting five hundred acre lake of Skarresø – today cherished as an area of outstanding natural beauty, replete with wildlife, flora and fauna. Jens Schou was in possession of great business expertise, and over the years he amassed considerable wealth; a noted philanthropist, he gifted one million Danish Krone to medical charities in his will. He died in Frederiksberg on 24 April 1935 and is buried in Copenhagen (Vestre). Ernst Schmiegelow in Hospital time. LXXVIII, 1935 505–07. HS Bülmann in the North. medical t. X, Helsinki s. II 1120f. L. Power in Asclepius' servants, ed. Anker Aggebo II, 1937 26. E. Dahl-Iversen: Our surgical heritage, 1960 = Festkr. ed. by Kbh.s univ. May 1960 312–27. "H.M.S. 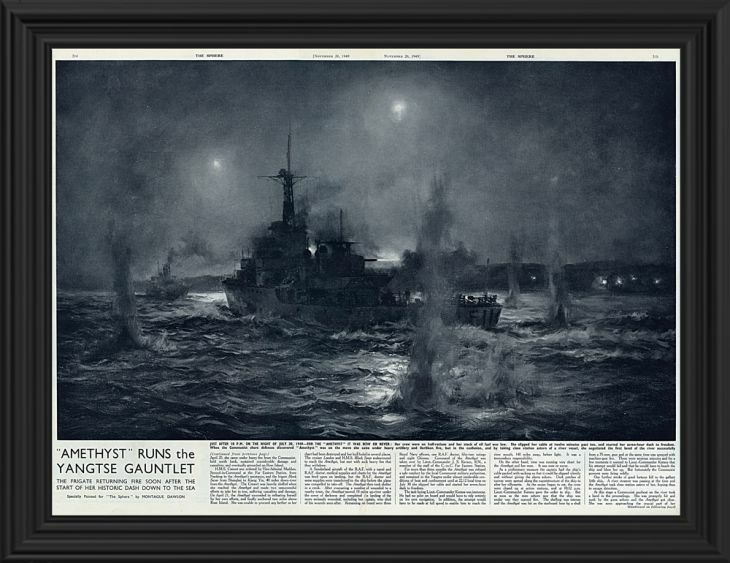 Amethyst Running the Yangtse Gauntlet, 1949"
We are delighted to bring you fresh to market from a private art collection a superb and historic painting by the legendary marine artist, Montague Dawson (1890-1973), a painting which celebrates one of the most famous incidents in post-war naval history. "The epic of the Amethyst, unique in itself, is in line with the traditions of the British Navy through countless generations. It was that trueness to pattern that caused the exploit of the Yangtse to be hailed throughout the English-speaking world; it was for that reason that London added its acclaim last week to that of Hong Kong, Malta, Gibraltar and Plymouth, which welcomed the Amethyst's men on their 10,000 mile journey home. The story began on April 19th, 1949 when the frigate Amethyst was standing-by with other ships of the Far Eastern Station in case British and Commonwealth nationals had to be evacuated from China. On April 19th Amethyst sailed from Shanghai to relieve the destroyer HMS. Consort, stationed at Nanking and beleaguered by the Communists. When HMS. Amethyst, with Lieutenant-Commander B. M. Skinner, RN., in command, reached a point in the Yangtse River some 60 miles from Nanking on the morning of April 20th, she came under heavy fire from the Communist-held north bank, sustained considerable damage and casualties, and eventually grounded on Rose Island. HMS. Consort was ordered by Vice-Admiral Madden, Second-in-Command at the Far Eastern Station, from Nanking to the Amethyst's assistance, and the frigate Black Swan from Shanghai to Kiang Yin, 40 miles down-river from the Amethyst. The Consort was heavily shelled when she reached the Amethyst, and made two unsuccessful attempts to take her in tow, suffering casualties and damage. On April 21st, the Amethyst succeeded in refloating herself by her own efforts, and she finally anchored two miles above Rose Island. She was unable to proceed any further as her chart had been destroyed and her hull holed in several places. The cruiser London and HMS. Black Swan endeavoured to reach the Amethyst, but met with such heavy fire that they withdrew. A Sunderland aircraft of the RAF, with a naval and RAF. doctor, medical supplies and charts for the Amethyst was fired upon on landing, but the RAF. doctor and some supplies were transferred to the ship before the plane was compelled to take off. The Amethyst then took shelter in a creek. After evacuating a number of wounded to a nearby town, the Amethyst moved 10 miles up-river under the cover of darkness and completed the landing of the more seriously wounded, including her captain, who died of his wounds soon after. Remaining on board were three Royal Navy officers, one RAF. doctor, fifty-two ratings and eight Chinese. Command of the Amethyst was taken over by Lieutenant-Commander J. S. Kerans, RN., a member of the staff of the C.-in -C. Far Eastern Station. For more than three months the Amethyst was refused a safe conduct by the local Communist military authorities, and remained in the Yangtse under almost intolerable conditions of heat and confinement until at 22.12 local time on July 30th she slipped her cable to freedom. The task facing Lieutenant-Commander John Kerans was immense. He had no pilot on board and would have to rely entirely on his own navigation. In addition, the attempt would have to be made at full speed to enable him to reach the river mouth, 140 miles away, before light. It was a tremendous responsibility. On the other hand, time was running very short for the Amethyst and her men. It was now or never. As a preliminary measure, the captain had the ship's cable packed with sacking so that it could be slipped silently and without giving the alarm ashore. Dark patches of canvas were spread along the superstructure of the ship to alter her silhouette. As the moon began to set, the crew were closed up at action stations, and at 10.12 pm. Lieutenant-Commander Kerans gave the order to slip. But as soon as the men ashore saw that the ship was under way they opened fire. The shelling was intense and the Amethyst was hit on the starboard bow by a shell from a 75-mm. gun and at the same time was raked with machine-gun fire. Those were anxious minutes and for a few moments it seemed to Lieutenant-Commander Kerans that his attempt would fail and that he would have to beach the ship and blow her up. But unfortunately the Communist gunners were firing wildly. One further stroke of good fortune fell to the gallant little ship. A river steamer was passing at the time and the Amethyst took close station astern of her, hoping thus to escape detection. At this stage a Communist gunboat on the river took a hand in the proceedings. She was promptly hit and sunk by the guns ashore and the Amethyst got clear. She was soon approaching the crucial part of her passage. Kiangyin itself was heavily defended and just below it was a boom stretched across the river, made up by sunken boats, with a narrow channel through marked by white buoys, It was pitch dark now and she could scarcely hope to see the buoys. She would have to break through the boom, and its strength was uncertain. Off Kiangyin she again came under the fire of offshore batteries. Just before 1am. on the 31st she signalled "Under heavy fire off Kiangyin", and twelve minutes later, "Still under heavy fire – nearing boom". She made no more signals for two hours. Those were anxious hours for the Commander-in-Chief. The Amethyst was now in the most difficult part of the river and to the hazards of gunfire were added those of navigation. But the tension was relieved at 02.42, when a laconic signal, "Hundred up" showed that she was still going strong. And indeed it was so. Two and a half hours later she reported "Woosung in sight" and shortly afterwards she made contact with HMS. Concord, which was waiting for her just off the mouth of the river. Here Amethyst made her last signal "Have re-joined the Fleet. No damage or casualties. God Save the King". Her ordeal was over."